Who is L. Ron Hubbard? 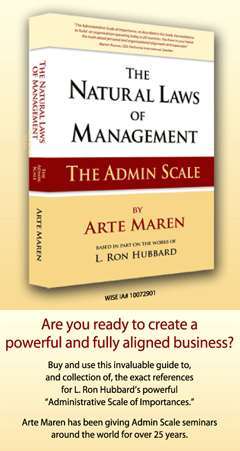 On this 7th Episode of BusinessWise TV, host Arte Maren interviews sales expert Patrick Valtin about the Emotional Tone Scale and how it can be utilized to dramatically increase one’s ability to sell. Mr. Valtin has an extensive experience in the fields of Management consulting, training & coaching, and this on an international basis. His specialties as a consultant extend from recruitment to sales and sales management, leadership, organization and corporate strategy. His professional experience with US and European corporations plus his early background as a salesman (started at the age of 15) gave him a strong taste for down-to-earth management principles which can be applied by pragmatic business owners around the world. Mr. Valtin has traveled in more than 30 countries over the last 20 years and has trained more than 85,000 people in the areas of recruitment, sales, marketing, Human Resources Development, organization and leadership. Patrick Valtin was an International Business consultant for the Belgian Government between 1986 and 1988. Looking for an effective way to help small business owners, he then started U-MAN Belgium in 1988. The company soon became a leader in its field and remains today the biggest training company for small businesses in the country. An MBA from the Moore Business School, USC in 1982 (Master of international Business Studies), Patrick Valtin also graduated from the “Hubbard® Organization Executive Course” in 1992, a specialized course for consulting business owners and executives of small-to-medium sized companies. Patrick Valtin is a founding member of the Advisory Board for the Hubbard College of Administration International in Los Angeles, CA. He is the president/CEO of M2-TEC USA, Inc. and the founder of the Execlife® Training & Coaching Group, LLC. Patrick Valtin’s consulting and coaching company is accredited by the Better Business Bureau (B,B,B. – West Florida chapter). He is a member of the National Federation of Independent Business (NFIB) and a member of the Greater Tampa chamber of Commerce. He is also an honorary Freedom Fighter for the Citizens’ Commission on Human Rights (CCHR Florida). Patrick has been happily married for almost 30 years to Chantal Valtin. They live in Clearwater, Florida and have three wonderful kids: Anne, Steve and Nathan. Copyright © 2019 by Axiom 10 Productions. All Rights Reserved.